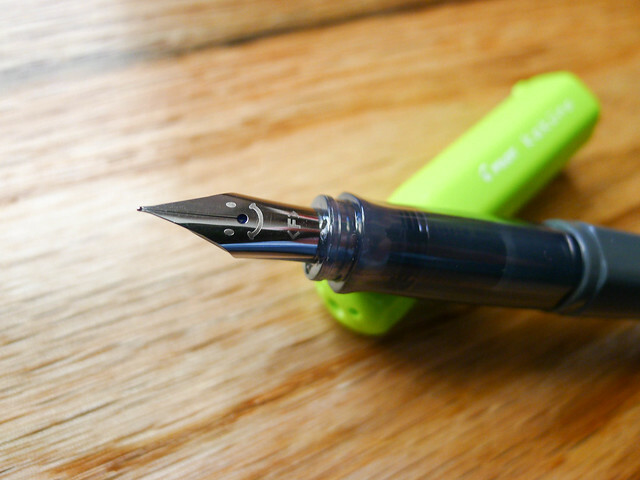 What is the best fountain pen for beginners? I get this question all the time. My stock answers are the Lamy Safari and the Pilot Metropolitan but of course the real answer is "it depends." The Pilot Kakuno will be joining - and maybe even replacing - the pens mentioned above as one of my favorite fountain pens for beginners. Instagram has been a great resource to see what pens are hitting the Japanese market before makng their way to the US market, and pictures of the Kakuno have been popping up in my feed for months. I was in love with the simplicity of this pen before even getting my hands on it, and now that it is here I love it even more. Let's be clear about one thing up front: The Kakuno is marketed towards school children in an effort to learn how to hold the pen properly and help improve their penmanship. Lamy did the same thing in the ABC fountain pen with their now commonplace grip design. Marketing aside, this pen is for anyone who can appreciate great design and excellent performance. The plastic barrel and cap feature a hexagonal shape to keep the pen from rolling off the desk, with an added bump on the cap if the pen starts to get away from you. There is also a groove in the cap to help with removal. The nib is standard Pilot quality. For those not playing the home game, standard Pilot quality is code for awesome. The F nib in my pen performs identically to other Pilot nibs found in the Prera and the like. It's fine, firm, and consistent. 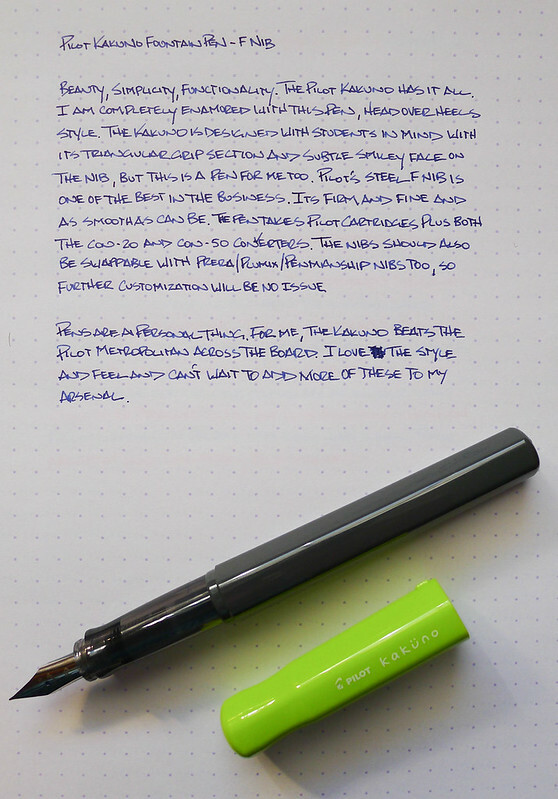 I'm assuming it is also swappable with other sizes (like the EF in the Pilot Penmanship or italic in the Plumix) but I haven't tried yet. I'm having too much fun writing with it as-is! If there is any "gotcha" with this pen it is that there is a smiley face on the nib. It is there so kids know when they see the face they are holding the nib in the right direction. I thought it might detract from my use of the Kakuno but it is barely noticeable from a normal writing distance. Besides, what is more fun than a smiley face nib? 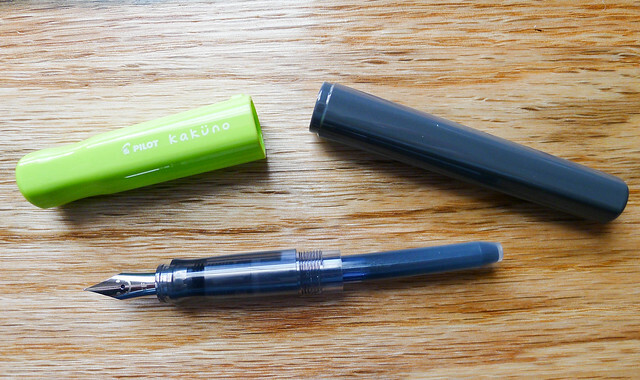 I see the Kakuno becoming a staple in Pilot's lineup, even moreso than the Metropolitan. The barrel is a blank slate, calling out for a huge range of colors and designs, and likely even some Japanese marketing tie-ins which are popular. Pilot could take this anywhere, especially with such a strong price point and the ability to use Pilot's ink converters. For me, I'm taking it everywhere. It is highly portable, fun to look at, comfortable to hold, great to write with and downright cool. There is no doubt I will be adding more to my collection. 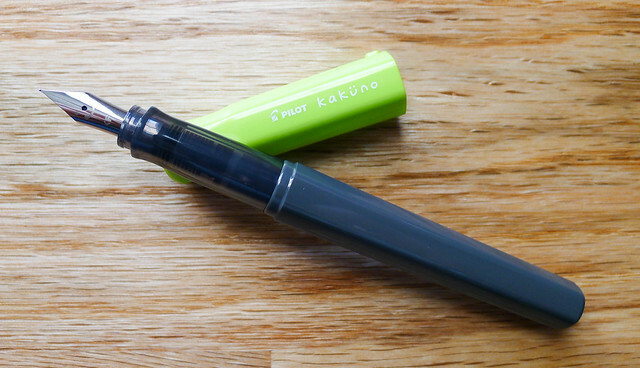 Posted on December 19, 2013 by Brad Dowdy and filed under Fountain Pens, Pilot, Pen Reviews, Kakuno.